Leading food industry professionals have praised the skills of University of Ulster Consumer Studies students, after judging product proposals and business concepts developed and presented by the Coleraine-based students. Final year students on the University of Ulster’s BSc (Hons) Consumer Studies degree carried out a product presentation to a panel of professionals from the food manufacturing and retail industry. They formed their own company, devised a company name, in addition to creating a brand and core values for the products which they developed. In all, five companies were formed and the students carried out the tasks necessary for product development, including marketing research, conducting desk research, primary research, sensory analysis and holding boardroom meetings, all of which culminated in the production of various food products which were suitable for the food service sector, the corporate hospitality sector, food retail sector as well as the restaurant industry. An expert panel made up of Mrs GrÃ¡inne Allen (Visiting Professor, Consumer Studies and Director of The Rainmaker Company), Mrs Charlotte Judd (Category Manager, Sainsburys) and Mrs Donna Worsely (Head of Innovation, Oscar Meyer). sampled and judged products ranging from Tapas, Cake of the Month Mix, Luxury Desserts, Mini Desserts and Afternoon Tea for Two. The winning company was the ‘Millrush Foods’ team, which devised a winning product concept based on the Pret A Manger business model selling Tapas style foods under the brand name Cuatro. Given that their product concept was a healthy option, it was decided that the strap line for the company should be: Better Flavour, Better Quality, Better You! Niamh Kelly, Marketing, Promotion and Packaging Design Director for Millrush Foods, said “it was highly rewarding to witness our team grow in confidence, knowledge and enthusiasm from idea generation to product pitch. Team work and organisational skills were vital to the company success, as Millrush Foods is not only a company comprised of undergraduate Consumer Studies students but also lifelong friends in the making. To work alongside such people in a challenging and competitive environment was intense, however to win the BakkavÃ¶r prize award for the most innovative product was a momentous achievement. Food Innovation provided me with many skills, memories and challenges whilst also preparing me for the world of work”. Another company member Gemma Donnelly also added; “receiving this award has made all the hard work and long hours worthwhile”. Two other company members, Leah Doherty and Neal McParland summed the experience up by saying that “winning the BakkavÃ¶r award for the most innovative food product is the perfect way to conclude four very enjoyable years and will be one of our most many happy memories whilst studying Consumer Studies at the University of Ulster, Coleraine”. Commenting on the winning company, the Visiting Professor GrÃ¡inne Allen said: “I was very impressed with the final year Food Innovation teams on a number of levels. Firstly, all the project teams demonstrated that they understood and knew what good eating quality and good product ideas should look like. Furthermore, she added “Millrush Foods product proposition was clear; they defined their vision and business model and had excelled themselves in defining every detail on how they would deliver their Tapas concept to market”. Charlotte Judd, the Category Manager from Sainsburys said that “the Food Innovation module provides the students with great hands on experience of the food industry, some of the challenges we face and is a great way to bring to life a taste of what the role of a product developer entails. The winning company presented as a cohesive team, were articulate and demonstrated great food skills. 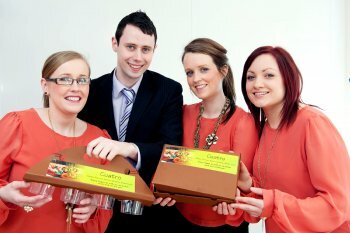 Their product concept was well thought through, innovative and most importantly, tasted delicious! I was particularly impressed with the packaging mock ups they showed which demonstrated real innovation”. According to course director Dr Desmond Hill, “The comments from members of the industry panel reflect the hard work and dedication of the students. It also brings together academia and industry providing the students with a realistic experience in that they operate as a company from idea generation through to product presentation which meets the standards demanded by industry and increases their employment prospects”.